For once, Sen. Bernie Sanders (I-Vt.) wasn’t the best speaker in the room. Sanders took second billing Thursday night at a packed Democratic Party fundraiser in Burlington’s ECHO Leahy Center for Lake Champlain. 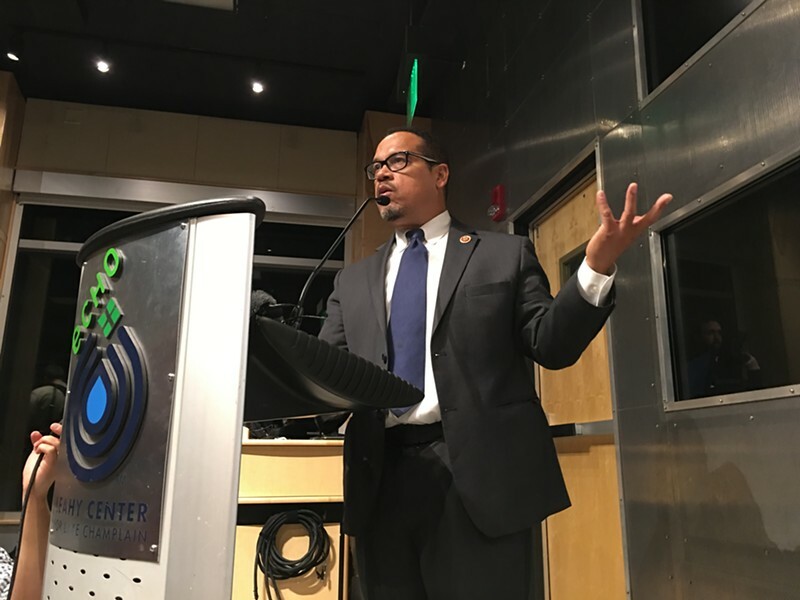 The lead act was Congressman Keith Ellison (D-Minn.), the only Muslim in Congress and one of the most prominent supporters of Sanders’ 2016 presidential candidacy. Ellison proved himself to be a masterful speaker. Without using any overt theatrics or speechifying gimmickry, he held the crowd’s attention through a 25-minute speech. Not bad, when you consider that everyone had been on their feet for at least two hours when Ellison walked to the podium. He had been preceded by a host of others, including state Democratic party chair Faisal Gill, Congressman Peter Welch (D-Vt.), Burlington Mayor Miro Weinberger and Burlington City Councilor Joan Shannon, and — a bit oddly — Don Sinex, the man behind the redevelopment of the Burlington Town Center. Sen. Patrick Leahy (D-Vt.) appeared via video message; he had stayed in Washington, D.C. because his wife, Marcelle, had surgery earlier in the day. The focus of Ellison’s address was the state of the Democratic Party, and what it needs to do to rebuild and re-energize. And the first step, he said, is to stop thinking of the Democratic Party first. "The Democratic Party is really not for Democrats," he said, and then feigned a look of horror at what he’d just said. "No, the Democratic Party is not for Democrats. The Democratic Party is for the American people. It’s for everybody." The party, he said, has to be "a collection of people who unite together on shared values of economic inclusion and liberty and justice for —" he paused, and the audience cried "ALL!" But, he added, "We haven’t been that over the last several years." Which would seem to indicate that the problem began during the Obama presidency, not in Hillary Clinton’s 2016 campaign. Ellison was Sanders’ choice for chair of the Democratic National Committee earlier this year; he was supported by the Vermont Democratic Party but narrowly lost the race to Tom Perez, a former member of the Obama cabinet. Ellison is now a deputy party secretary. He made no mention of his current party post or Perez — or Clinton, for that matter. He just made his own pitch for a new, revitalized, "wide open" Democratic Party that’s engaged with its people all the time, not just during election season. "Some of the pastors out there are like, 'Okay, must be election time because you never show up at my church any other time,'" he said. "We can’t just talk to them when we need them — we’ve got to talk to them ALL. THE. TIME. That’s the Democratic Party that we need, an inclusive party that is palpable, that is present in the lives of people every single day." That, he said, is the key to a successful message. No matter how skillfully a platform is constructed, it won’t resonate unless there’s an established relationship with people. He pointed to this week’s Democratic victories in Virginia. "We have to de-emphasize the money, and re-emphasize the people," he said. "We’ve got to be in the VFW Halls, churches, mosques, synagogues, on the doorsteps. We had a good day on Tuesday because we made massive investments on the doors. The Democratic National Committee didn’t spend any money on television on Tuesday. One hundred percent of the money we spent, was spent on the ground." His call for a new kind of party resonated with the audience. Although it must be said that the crowd was full of the old-fashioned kind of party regulars: officeholders, party functionaries, major donors and even some lobbyists. They seemed receptive; but they are also the pillars of a party that’s struggling to stay relevant in an age of independent progressive interest groups. It’s also a party that was desperately hoping the Ellison event would replenish its meager finances — desperate enough to give a deep-pocketed developer a few minutes at the microphone to extol his big project. The party faithful loved Ellison’s talk; it remains to be seen if they can walk the talk as well.